Some posts are born to greatness; others have greatness thrust upon them. It’s hard for short content to get attention now — there’s just too much mediocre, shallow content to compete with. But long-form content is having a renaissance. Give your readers something they can really dig into, something that covers everything they need to know about a specific, relevant topic. There’s no simpler value proposition than learning how to do something you need to do. Make sure your how-to is simple, direct, easy to follow, and not overly-promotional, and you can create a resource built to last. These posts are both easy to create and incredibly valuable for the reader when done properly. There are hundreds of software tools available for virtually every industry. People need help navigating the landscape. Publish your comprehensive guide to the tools you and your brand find useful, and update it frequently as the landscape changes. Here's an example of one of our own (recently refreshed) pieces on social media marketing tools. The internet tends to have a short memory. Content that captures the historical context of your industry, or technology that your audience uses at work, is bound to get attention and stay relevant over the years. Just make sure to update your timeline with the latest developments! In theory, evergreen content (when crafted with a best-answer mentality) should bring in search traffic without much extra attention on your part. But you shouldn't settle for search alone. You know the content is resonating with your desired audience, so give it as much of a chance to be seen as possible. Don’t make your social promotion a one-and-done proposition. Social feeds move so fast, and organic reach is so limited that posting the same content multiple times is practically required. Establish a cadence with unique messaging to consistently promote your evergreen content long-term. You want to put your best content forward when investing in paid social, so it makes sense to promote content that has proven to have lasting value for your brand and your audience. Promote your evergreen content with ads and test different audiences with each post. All content should be created with SEO in mind. But as algorithms and how people search evolves, make your content even more of a search engine magnet by sprucing up your SEO. Make sure your title and tags are optimized, and that your meta description makes a compelling case for clicking through. You can also take a look at competitor content that’s ranking for similar keywords and fill in gaps in your own content. Email marketing is still one of the most powerful ways to reach an audience. Use your monthly/weekly newsletter to get your evergreen content in front of your most valuable audience — you already know the content is worth their time, so be bold. Once your evergreen forest is growing and thriving, make sure to keep it up-to-date and relevant. Here are a few ways to keep your content ecosystem healthy. Okay, I admit that we break this rule on the TopRank Marketing Blog from time to time. So do as I say, not as I do: Keep your posts timeless by not embedding the date in your file structure. Your how-to guide may still be relevant, but if the URL says 2010, people will be disinclined to read further. When you audit evergreen content, look for elements that are no longer adding value for the reader. Trim irrelevant content, update outdated info, and check for dead links. If you have influencer material, make sure their job title and bio are up-to-date as well. Odds are there are a few evergreens in your forest that you don’t want around. For example, you might have a post about services your company no longer offers, or on a topic your brand doesn’t want to be known for. If these evergreens are still pulling in traffic, they can hurt your brand’s reputation. Look for posts with high traffic but high bounce rates as well — rework or remove them to improve your search engine credibility. Let’s be honest: Most content is temporary. No one is digging deep into a blog’s archives looking for content when there’s plenty of new stuff out there. As the content keeps piling up, it’s more and more important for brands to invest in content meant to provide value for months, even years, to come. [bctt tweet="As the content keeps piling up, it’s more and more important for brands to invest in content meant to provide value for months, even years, to come. - @NiteWrites #EvergreenContent #ContentMarketing" username="toprank"] Start planting your evergreen saplings now, cultivate your forest, and you can make your site a destination for your audience. How else can you power your evergreen content and overall content marketing strategy? Earning links. Learn how to create link-worthy content and see examples. 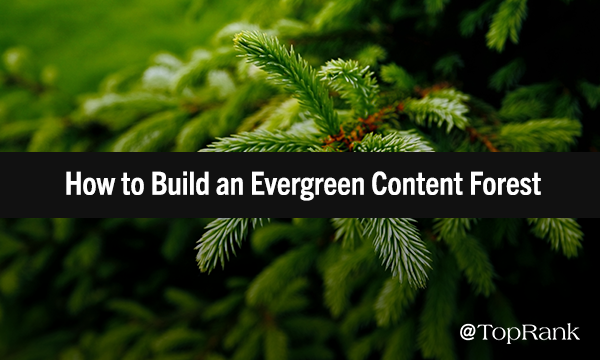 The post How to Build a Resilient Evergreen Content Marketing Forest appeared first on Online Marketing Blog - TopRank®.